The most expensive goalkeeper in football history has already shown Liverpool the value of his nifty fingers. Alisson Becker, the £65 million capture from Roma, used a training camp before his debut against Napoli to exhibit his guitar skills during the club's karaoke night. "Nobody had any idea about that," said his manager, Jurgen Klopp. He will be hoping the expensive replacement for Loris Karius is more Ray Clemence than Ry Cooder over the next six years, but it took less than three minutes for the Brazilian to strike the right chord at the Aviva Stadium. Liverpool's penultimate warm-up game, which they won 5-0, was ignited by a 35-yard diagonal ball from Alisson to Mo Salah, so perfectly executed it hinted at a playmaking as much as goalkeeping role. The 25-year-old spent most of his debut showing off this passing repertoire. Evidently this will be part of his and Liverpool's armoury in the same way as Ederson at Manchester City. Repelling counter-attacks will be more important than triggering them, but the boisterous reception Alisson was granted by the Kop's Irish branch echoed the yearning for security between the posts in the wake of Karius's toils. Facing a side led by the esteemed Carlo Ancelotti, Liverpool began purring. They were two up within ten minutes thanks to James Milner and Georginio Wijnaldum, but all lenses were directed towards Liverpool's goal, vociferous applause reserved for Alisson's every touch. Even the unnecessarily risky passes. When he was summoned to make his first save, he obliged, denying Lorenzo Insigne on 25 minutes. The Merseyside club paid a premium to secure the Brazilian No 1 - Karius's Champions League final performance ensured Roma could continue to haggle upwards in the knowledge Alisson was this season's must-have accessory for Klopp. The South American certainly looks the part visually, his physique noticeably more powerful than his current deputy. Evidently the new arrival is not superstitious, temporarily assuming the No 13 jersey as he waits for Karius to vacate the No 1 as well as the Anfield premises. That will have to be in the next four days if Alisson is to get the coveted shirt before next weekend's Premier League opener against West Ham United. Rarely has a summer recruit been so well received before playing for the club, which is even more noteworthy given Alisson conceded seven in two games for Roma against Liverpool in the Champions League semi-final. There was nothing particularly persuasive about his performances in those two legs, but over the course of his Serie A career there is plenty of evidence he will be a vast improvement on his predecessors. Frankly, had Klopp urged goalkeeper coach John Achterberg to come out of retirement, it might have been a more reassuring sight than Karius prolonging a torture that showed no sign of easing during the club's first warm-up fixtures. That reflects the desperation of The Kop not only for a replacement for the distressed German, but for reliability in goal lacking since Pepe Reina's first few seasons as far back as 2006. Since Reina's exit - and he deteriorated in his final three years - Simon Mignolet, Brad Jones, Adam Bogdan, Danny Ward and, latterly, Karius have been unable to end consistent calls for the club to invest heavily in the position. 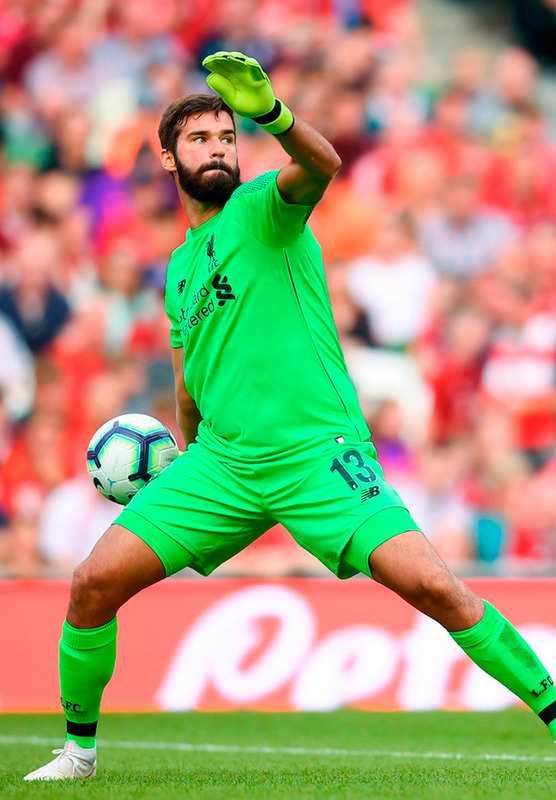 This friendly was never going to offer an answer as to whether Alisson will instantly cure the ills, but a glaring weakness has been addressed. It all adds to the pre-season confidence building at Anfield. Klopp's strong starting line-up offered a clue as to his preferred line-up for next weekend's opening act. Joe Gomez started alongside Virgil van Dijk at centre-half. Midfield signing Fabinho was on the bench. Despite only being in training for a week, Roberto Firmino was reunited with Salah and Sadio Mane. The speed and technique of their build-up play looks as thrilling as ever. Napoli were chasing the game before they had a chance to settle. "We decided already that he is a world-class goalkeeper, that's why we brought him in. Now let's play football together," said Klopp. Liverpool (4-3-3): Alisson; Clyne, Van Dijk, Gomez, Robertson; Milner, Naby Keita, Wijnaldum; Salah, Firmino (Shaqiri 46), Mane. Napoli (4-3-3): Karnezis; Hysaj, Albiol, Koulibaly, Luperto (Rui 46); Allan, Hamsik, Fabian; Callejon, Milik, Insigne.